A bio-active solution that destroys offensive odor molecules from feces, urine, sweat and more.
? FAST-ACTING + POWERFUL. We make sure the stain and the stink are taken care of — no elbow grease required! Tackle gross spots and accidents your cat or dog left behind whether it was a minute ago or a month ago — we’ve got your back.
? SAFE + CLEAN. Nontoxic formula has a neutral pH specifically to be safe for household cleaning and use around your home, including children and fur babies! Safe for use on and around food surfaces and sofas, beds, car seats, upholstery, etc. Chlorine free and color safe.
? STAINS HAPPEN. We get it. 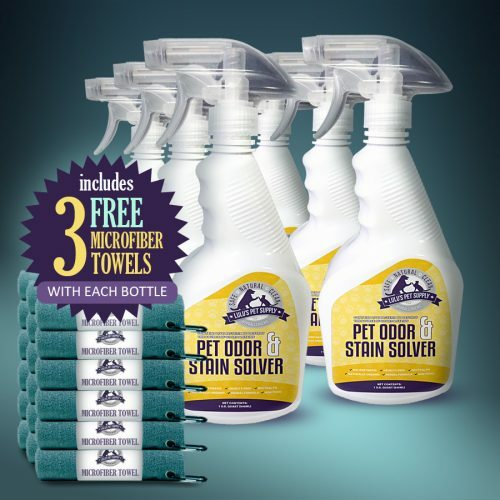 Lulu’s Pet Odor & Stain Solver is safe for essentially any surface pee (and poop!) could get on. 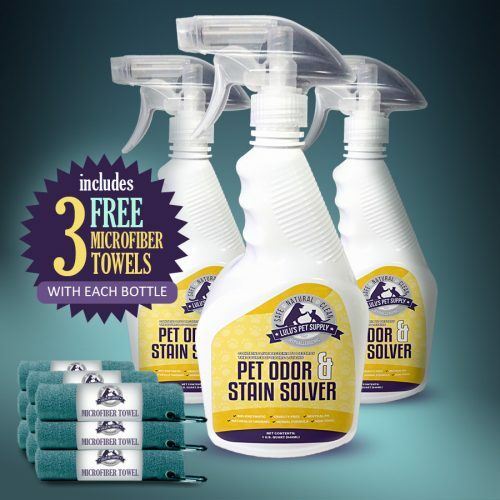 For use on carpets, furniture, litter boxes, crates, kennels, floors, rugs, clothing, carriers, all dog and cat living / sleeping areas, vehicle seats, and more — anywhere not harmed by water.
? ACTIVATED BY LIVE ENZYMES. Enzymatic bacteria fights nature with nature by targeting odor and stains at the source. Organic matter and stench caused by urine crystals are encapsulated using bioenzymatic properties until they’re entirely eliminated.
? 100% SATISFACTION GUARANTEED. If your spots and smells don’t disappear — we’ll refund you in full. No bones about it! → Ready to use. Just give it a spray and go on with your day! → Completely safe for your family and pets. → Doesn’t just mask organic issues — our bio-enzymatic formula permanently removes the smelly & unsightly problem by fighting nature with nature in just one spray. 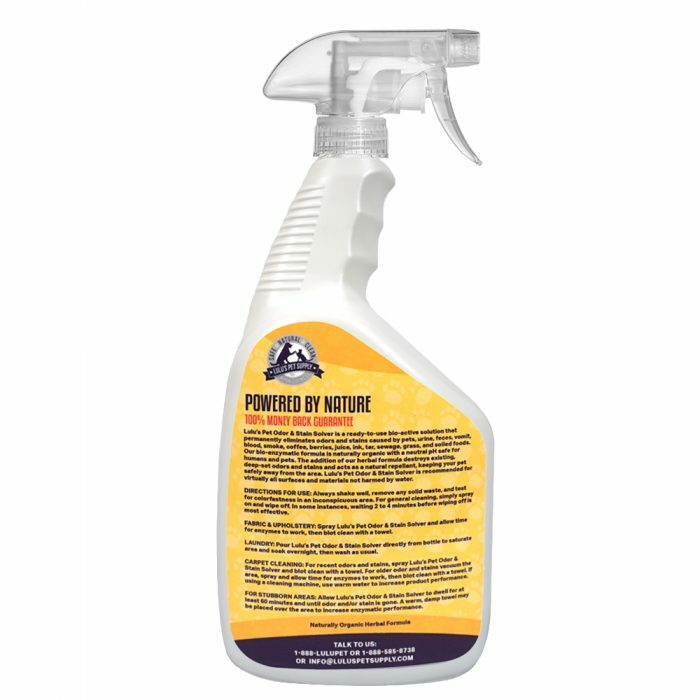 → Destroys the source of foul odor & stains using live and dormant bacteria to deodorize and neutralize, making surfaces fresh again. → Acts as a natural repellent to keep your dog or cat from returning to the same spot over again to mark his/her territory. → Ideal for nasty pet odors and stains from dogs, cats, rabbits, chinchillas & other small animals, as well as urine, feces, drool, vomit, blood, smoke, coffee, berries, juice, ink, tar, sewage, grass, soiled foods and MORE! 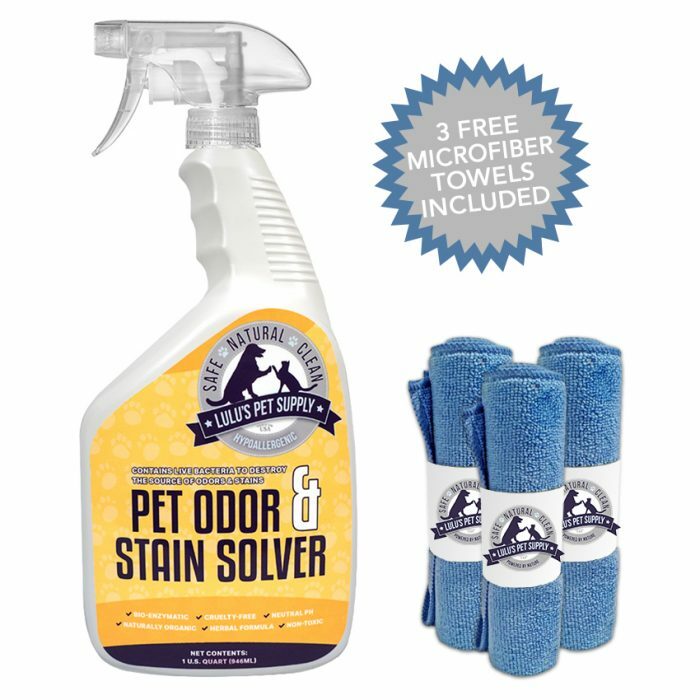 → Concentrated stain destroyer has deodorizing properties that make this a must-have for litter box odor, young puppy/kitten housebreaking & potty training, as well as for use with older/senior pets with kidney problems, incontinence, or urinary tract infection (UTI) issues who can’t help when/where they leave puddles. → Made in the USA with over 8 years of research & development.